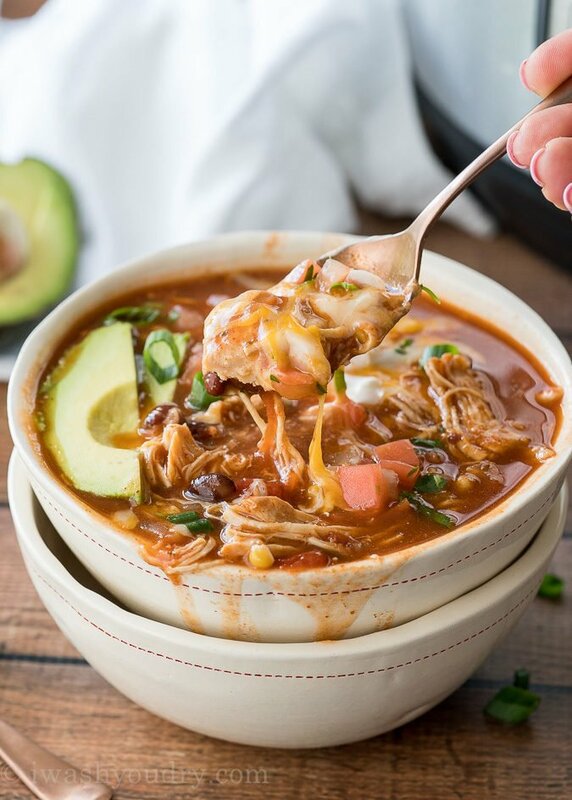 This Instant Pot Chicken Taco Soup recipe is filled with tender shredded chicken and loads of basic pantry staples for a quick and easy dinner your whole family will love! If you haven’t purchased yourself a pressure cooker yet, get on it! This recipe is just another example of how easy it is to make a delicious meal in minutes! 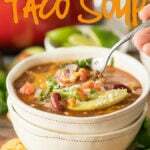 After I shared my Quick and Easy Taco Soup recipe I had so many of you tell me that you always toss in some Hidden Valley® Ranch Seasoning at the end. I was very intrigued, so I thought I would give it a try myself. Not only is this recipe quick and easy, because it basically contains all the pantry staples that my we store as a family, but I can also quickly pick everything up at Walmart, which makes my life so much easier. I found this Hidden Valley Ranch seasoning and salad dressing mix in the salad dressing isle of Walmart near the end of the isle by the other seasoning and sauce mix packets. I love that I can use the shaker can over and over again! 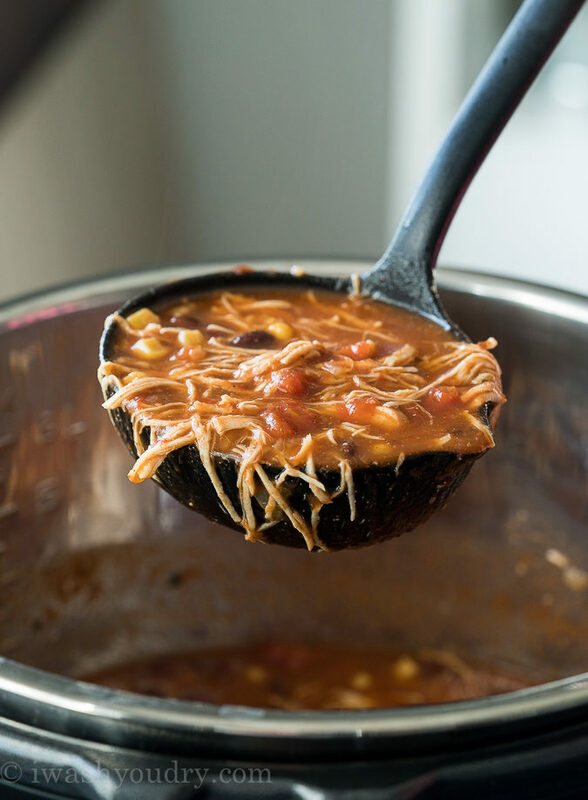 It’s perfect for dips, dressings and adding a little more zip to my Instant Pot Chicken Taco Soup! I just tossed everything into my Instant Pot, even the raw chicken, taco seasoning and ranch seasoning. I hit the soup button and walked away. 30 minutes later I pulled out the chicken and it practically fell apart as I was shredding it with two forks. 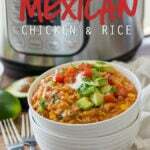 I tossed the chicken back in the pressure cooker, gave it a quick stir and dinner was ready! This soup is so good guys! We had just a little bit leftover from dinner so I put in the fridge and the next morning one of my kids warmed it up for breakfast. Don’t forget to top your soup with all the taco fixin’s. I feel like that is one of the best parts of this soup. Customize the toppings to your liking! Make it your own! Either way you dress it up, you’re going to love it! 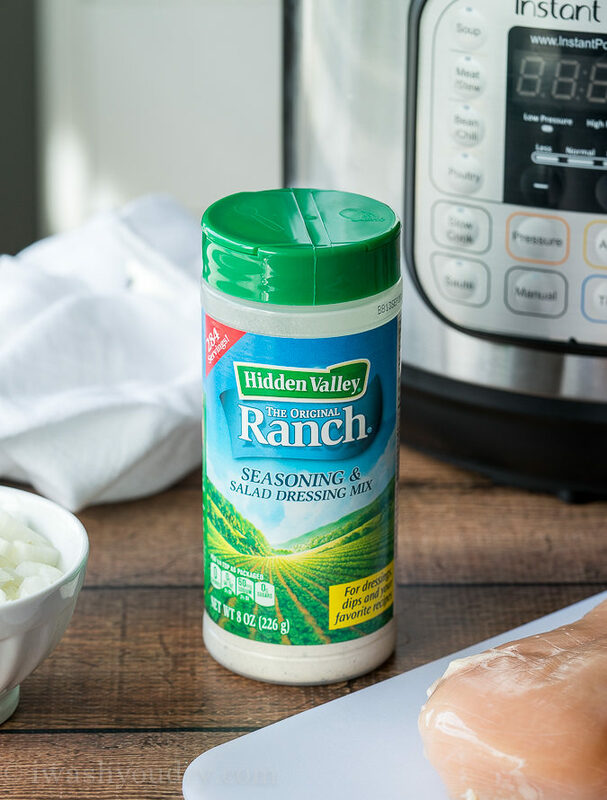 Be sure to check out Walmart.com for more Hidden Valley Ranch Seasoning recipe ideas! *UPDATE TO RECIPE: Due to so many getting a burn notice, I’ve added a can of chicken broth (or water) to the ingredients to prevent the burn notice. I’ve tested the recipe and it comes out perfectly! 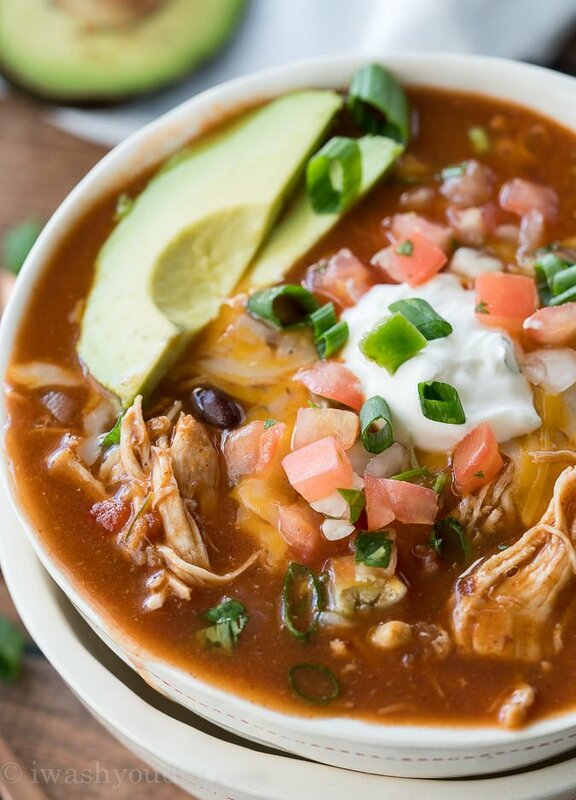 This warm and hearty Chicken Taco Soup is insanely easy to make and is a family favorite! 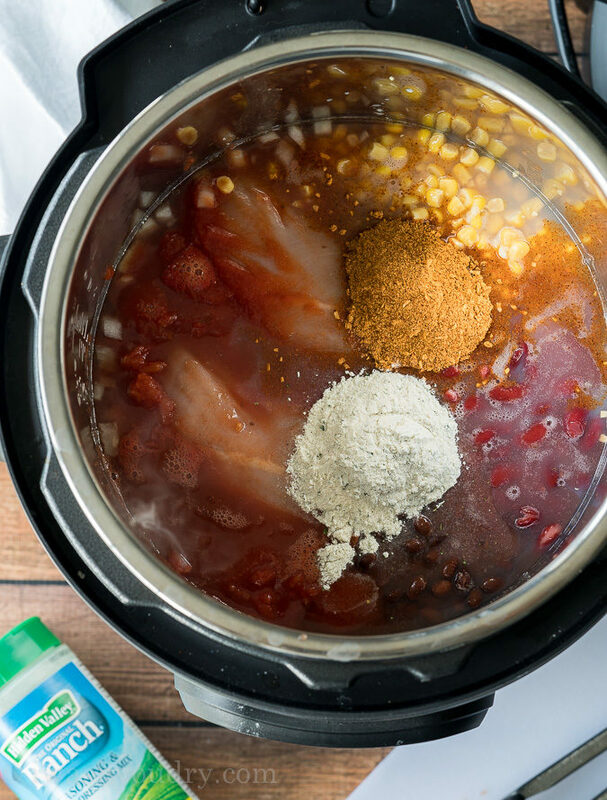 Add all the ingredients (except for the optional toppings) to the inner pot of your Pressure Cooker. Stir to combine flavors. Move the pressure release valve to the sealed position. Press the SOUP button or HIGH pressure for 30 minutes. Quick release the pressure when finished cooking. Remove the chicken breasts carefully and shred with two forks. Return the shredded chicken back to the soup and stir. Serve with optional toppings. Enjoy! *SLOW COOKER OPTION- Combine all the ingredients (minus the toppings) in your slow cooker and set to LOW for 6 hours or HIGH for 3 hours. 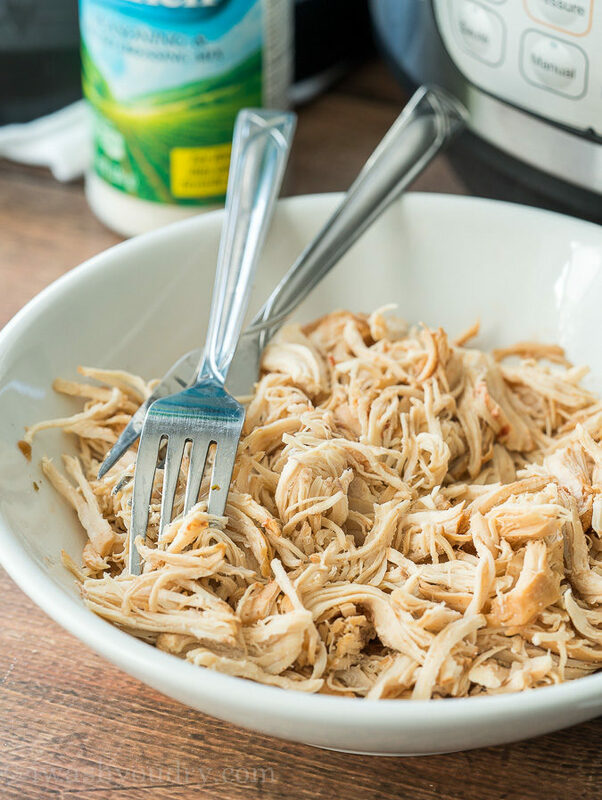 Shred chicken with fork and return to slow cooker. Serve with optional toppings. We loved this soup! It was easy to put together and used things we had on hand! Thanks so much! I’m going to try this but find it strange there isn’t a can of rotel or any green chilies in the taco soup which I always use when I make it. Feel free to add some green chilies or rotel to the soup! 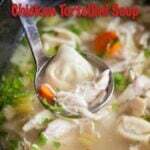 Did you add chicken broth to the recipe after the above comments as you state above several times that the onloy liquid is from the canned vegetables? Confusing! Yes, I updated the recipe to add the chicken broth. I’ve made it plenty of times without the additional broth, so I’m sure either way will work for you. I cheated!! 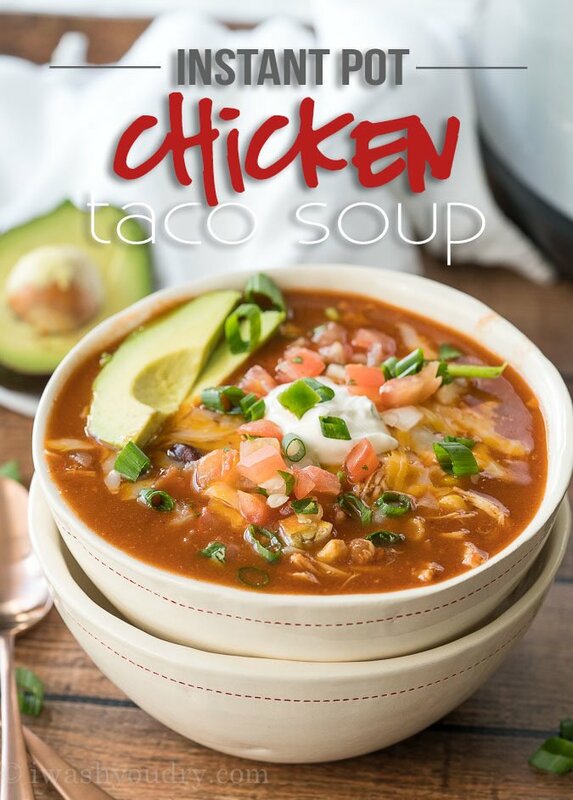 I had a just-purchased roasted chicken from Costco, so I shredded the breasts, sautéed the onion, put all into a large pot and came up with a sensational taco soup!! I have a stove-top pressure from 1952 (wedding gift!! ), but used good old Costco today!! Thanks for the recipe!! Love it! So glad you enjoyed the recipe! What would be the serving size for WW’s sake? Have you ever added a block of cream cheese to make it creamy ?! Wonderful recipe! I made it tonight and it was a huge hit. I used 1.5 lbs solid frozen chicken (with about 1/2 cup more chicken broth). And added 10 minutes to the cook time. It was perfect!! Thanks for this. I am doing a post on your recipe on my blog tonight or tomorrow and will definitely give you all the credit. Thanks again! Made the taco soup last night. We loved it, but I have a couple of comments on the ingredients and instructions. The can size of the beans, corn and tomatoes are listed as 15 oz. None comes in that size — corn and beans are 15.25 oz, diced tomatoes are 14.5 oz, and the black beans were 19 oz. Can size seems to be common problem for Instant Pot recipes. The cook time was double what the recipe claimed (30 min.). Using the “soup” setting, it took 35 minutes for the Instant Pot to come up to pressure, and 30 more to do the actual cooking. Worth the time and trouble, though. Can you double the recipe and would I need to double the time? I know silly question. Can you use frozen chicken? I made this tonight with frozen chicken and it turned out perfectly! I added 10 minutes to the cook time but I’m not sure that it was necessary. But 40 minutes cook time with 1.5 lbs frozen chicken was plenty. This was my very first recipe in my IP. I got a ‘burn’ message as well. Could be too many beans (starches) on the bottom of the pan, even though I stirred per instructions of the recipe. Other users told me to layer and not stir next time. Once I scraped the beans from the bottom of the pan and reset the time all went well and the soup had a great flavor. Hi Kathy, I retested this recipe last night with an additional can of chicken broth and it came out perfectly for me. I’ve updated the recipe to reflect this change. Glad you enjoyed the flavor of the soup! Wow! That’s awesome! Thanks for sharing! This soup was amazing! The entire family loved it! weight watchers 1 pt ingredients? My Instant Pot said burn twice. How do you remedy that? You would need to add more water, but once the pot says “burn” you’ll need to remove all the contents of the bowl, scrap any burned bits off the bottom and start over. I’ve never had this recipe read burn before, so make sure your valve is closed so no excess moisture escapes while cooking. Can you use died beans instead of can and how long if using dried ? Since there are so many other things in this recipe other than beans, you’ll be better off using either canned beans or already cooked beans (that were made in the IP). If you use IP cooked beans, make sure to add extra water to make up for the liquid inside the canned beans. Walmart as well as Lowe’s sells a MICROWAVE pressure cooker. Everything may be cooked in it and in such a short time. This has taken the place of my slow cooker.Will have to try your recipe for taco soup using it. Sounds good. I made this for some friends who came over to watch the game Sunday night. Added a TBS of cayenne, and garnished it with cilantro and sour cream. From the pictures, it looks like there’s more liquid then what’s just going to be in the cans of undrained veggies. Does there need to be water or broth added? If so, how much? Thank you! I promise that there is no extra liquid added to the soup. It’s all from the cans! Enjoy! Will it come to pressure withso little liquid? It doesn’t seem like enough! Also, can I use frozen chicken breasts? There will be plenty of liquid from the cans to let it come to pressure. You could use frozen chicken in this recipe, just add an extra couple minutes to cook time. Mine didn’t come to pressure. Tried again after I added a 1/2 cup water. Didn’t work again. Had to pull out the sauce and put it on the stove while I pressure cooked the chicken on it’s own. *oops just r Alize’s I used tomato paste (6oz) and i used 1.5 lb of frozen chicken. Maybe those 2 differences were the problem?